Tern folding bikes hit the sweet spot between full-sized bike and our most compact folders. Smaller wheels can produce a smaller folded package, but some people prefer slightly larger wheels, which offer increased stability and better long distance performance. Tern bikes fold less compactly but ride more like a traditional bike. Tern bikes provide the solid ride you’d expect from a conventional bike with all the benefits of a folding bike. A Tern folding bike folds in ten seconds, and you can bring it with you on public transit. Use it to crush your first or last mile. It’s perfect for multimodal commuters. It folds to fit where conventional bikes can’t, like under the desk in your cubicle or in the trunk of your car. From bus to bike to ridesharing service, seamlessly switch modes of transportation several times in a single trip. When you invest in a folding bike, you’ll have more opportunities to ride (i.e., you’ll save time and money on your commute, and you’ll get the health benefits of biking to work). 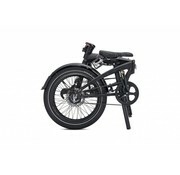 Tern folding bikes are well designed and built to last with fully serviceable joints and a 10-year warranty. Their stiff frames maximize pedaling efficiency and afford predictability and stability to the bike’s handling. Because they fit riders big and small, they’re great as a shared bike or a bike for a growing kid. Whether you’re a roadie type or casual cyclist who wants the benefits of a folding bike (decreased chance of theft, more opportunities to ride, etc. ), Tern has a folding bike model that will fit your needs. 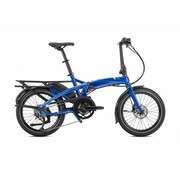 Starting at half the price of Brompton folding bikes, this low cost option is perfect for high school or college graduates. We can special order any Tern bike, so if it’s not on our site, contact us or come in to the store. Incredible power and range in an origami package. 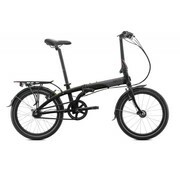 The Verge S8i is the world’s most versatile, ultra-low-maintenance folding bike.